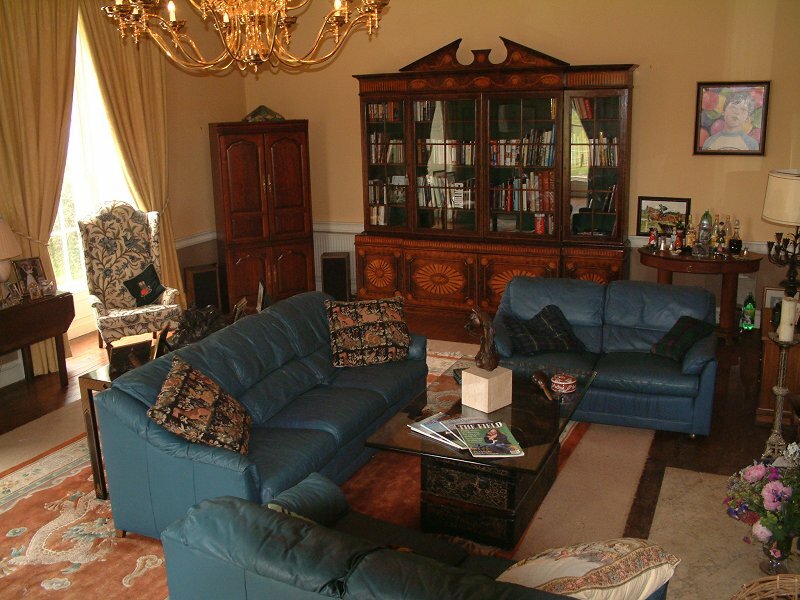 Set in rolling parkland this 'Grade A' listed Georgian House contains elaborate plasterwork, which has been carefully restored. Blazing turf fires, and huge bedrooms all being the hallmarks of this very rural country house, which is full of eye-catching features including a vaulted semi-basement, ornate cornicing, marble fireplaces, wooden floors, flagstoned hallway and barrel-ceilinged corridors. CASTLE FFRENCH, BALLINAMORE BRIDGE, CO. GALWAY . 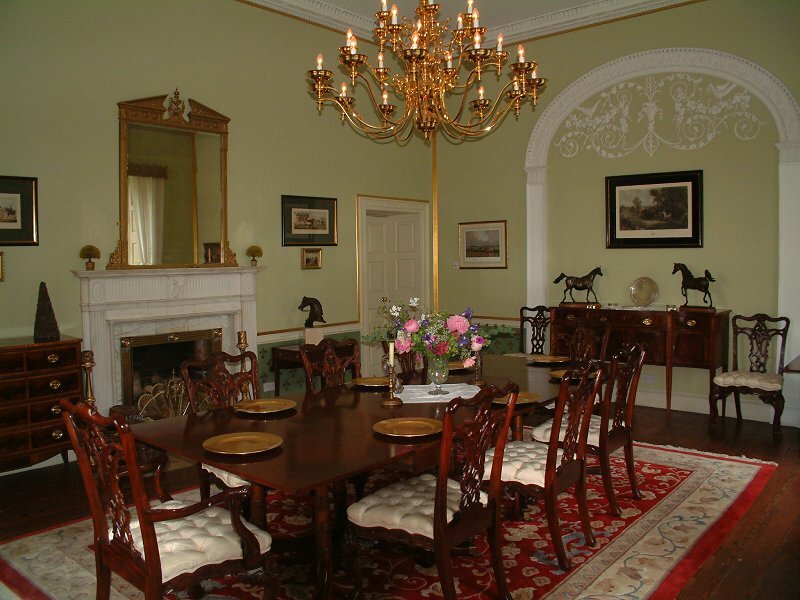 A MAGNIFICENT GEORGIAN HOUSE WITH FINE PLASTERWORK TOGETHER WITH GUEST HOUSE, COURTYARD AND AMERICAN BARN IN A PARKLAND SETTING WITH GOOD GRAZING LAND. ATHLONE 17 MILES, GALWAY 45 MILES, DUBLIN 97 MILES. 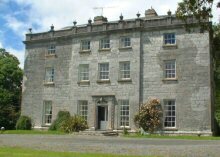 Castle Ffrench was the ancestral home of the French family one of the fourteen tribes of Galway . 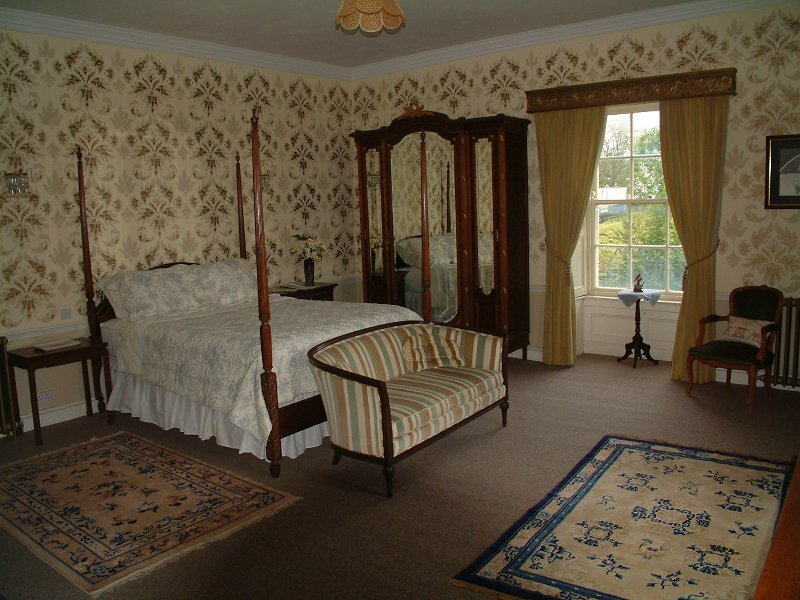 The house was built in 1779 by Sir Charles French, Mayor of Galway. The ashlar-faced house has three storeys over a basement with a fanlighted and pilastered doorcase. 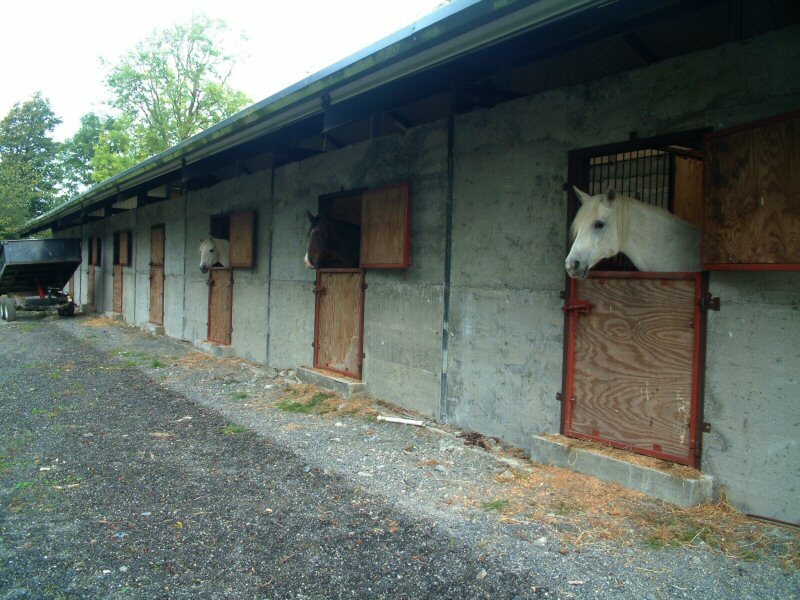 The interior plasterwork is of a style characteristic to Galway . 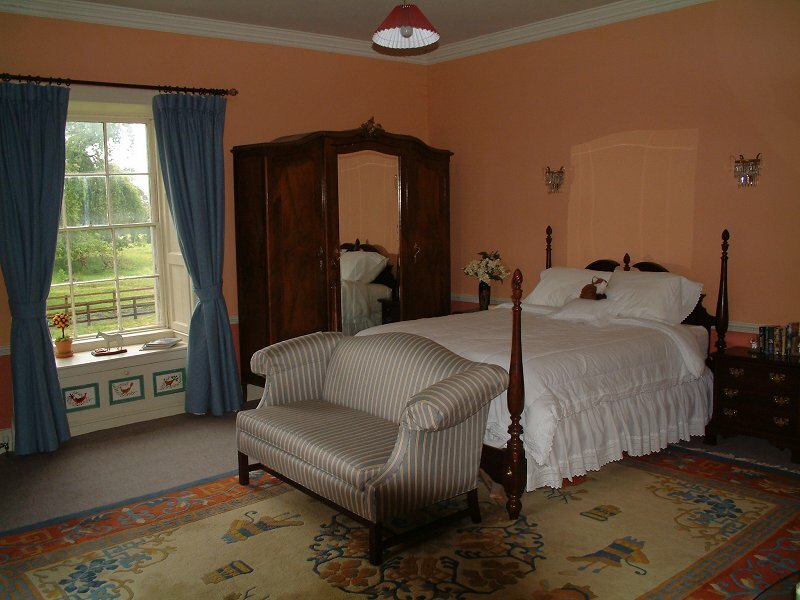 The interior plasterwork is of a style characteristic to Galway , with delicate naturalistic foliage and flower swags. The doors, door knobs, sash windows and shutters are all original, however the house also enjoys all the conveniences associated with modern living. 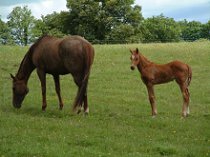 There is excellent hunting locally with the Galway Blazers, the Birmingham , East Galway and North Galway hunts. There are golf coursed nearby at Glassan and Athlone. The River Shannon, one of Europe 's longest navigable rivers is a short drive away. 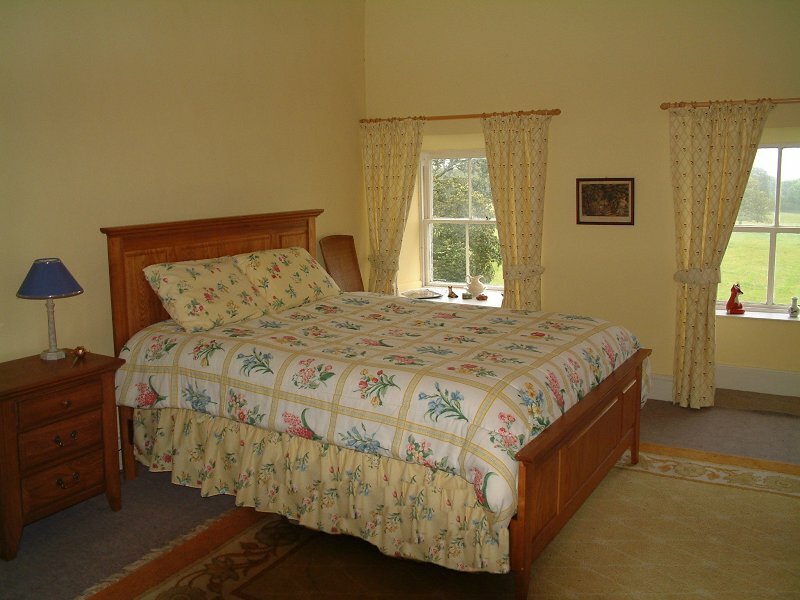 Lough Corrib internationally renowned for its Brown Trout fishing is within an hours drive of the property. The sandy beaches and majestic mountains of the west coast are within an easy drive. The provincial town of Athlone has prospered greatly in recent years and has a wide variety of shops and restaurants. The historic University City of Galway often referred to as the Capital of the west is an 3/4 hour's drive away. ENTRANCE HALL: 5.49m. x 5.79m. With Portland stone floor, marble mantel piece and ornate plasterwork ceiling and cornice. Carved timber architraves. DRAWING ROOM: 5.96m. x 8.15m. With pitch pine floor, carved marble chimney piece with brass inset. Bay windows with octagonal panelled shutters overlooking the gardens and grounds. 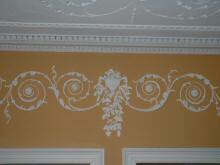 Highly ornate plasterwork ceilings and cornice. DINING ROOM: 5.64m. x 7.29m. Carved chimney piece and brass inset, pitch pine floor, ceiling cornice and fine plasterwork in alcove. 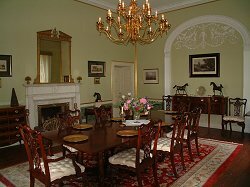 Dining in this spacious room with its picture windows overlooking the garden, its pitched pine floor, ceiling cornice and fine plasterwork makes each very special occasion that little more so. 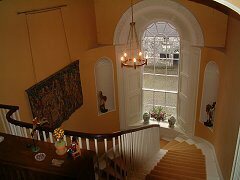 INNER HALL: Original winding stairs leading to first floor, fine plasterwork ceiling, cornice and niches. STUDY: 3.66m. x 5.64m. Fireplace, alcove with attractive archway. CLOAKROOM TO REAR OF HALL: W.H.B. and W.C.
LIBRARY: 6.02m x 3.28m. With fireplace and bookshelves. FIRST FLOOR: LANDING: With fine plasterwork, west facing arched window overlooking courtyard. BATHROOM 1: With bath, shower over bath, W.H.B., W.C. and shelves. BEDROOM 4: 5.43m. x 5.94m. Fireplace. BATHROOM 2: Bath with shower attachment, W.H.B. and W.C.
SHOWER ROOM 1: Partially tiled shower, W.H.B. and W.C. BEDROOM 5: 4.42m. x 5.94m. Fireplace. BEDROOM 6: 4.57m x 5.92m. Fireplace. BEDROOM 7: 4.80m. x 6.03m. Fireplace. BATHROOM: Roll-top cast iron bath, W.C., W.H.B. and fireplace. BEDROOM 8: 4.57m. x 5.72m. Fireplace. BEDROOM 9: 4.17m. x 5.66m. Fireplace. OUTBUILDINGS: Cobbled courtyard to rear of main house with attractive stone cottage divided into two apartments. 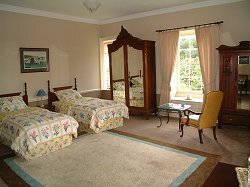 The accommodation in both includes sitting room, kitchenette, bedroom and shower room. 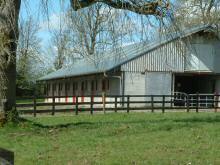 There is also a coach house, cow byre, store rooms with overhead loft and separate garage. Beyond the courtyard there is a recently built American Barn with 16 loose boxes, automated drinkers, feed hay store and overhead open loft. THE LANDS: The grounds total approximately 40 acres of which about 3 acres comprise the gardens, yards and some woodland. 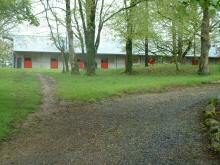 The remaining 37 acres are parkland situated to the front of the house. BASEMENT: Vaulted throughout with main door to courtyard. KITCHEN: 5.49m. x 6.55m. With flag stone floor, oil fired Aga cooker, extensive worktops and cupboards, stainless steel sink, granite top work island with gas hob, fitted cupboards, Kenmore oven, plumbing for dishwasher, fine vaulted ceiling and stone arches, two recesses one of which incorporates old bread oven, door leading to courtyard. BREAKFAST AREA: 4.19m x 6.10m. With slate floor and fireplace. LARGE UTILITY ROOM: Plumbed for washing machine, stainless steel sink, cupboards. SERVICES: Well water with treatment system, septic tank drainage, telephone.